Sunday will, indeed, be the last day for Natural Start as we know it, with new owners taking over soon. The new spot will, from what we have heard, be very different. Natural Start was, of course, a great player in the locavorism movement in Spokane, with a large portion of their ingredients coming from within a 30 mile radius, paired with DOMA coffee. There was definitely a reason we included the spot over at Only Eat Here. The re-imagined Natural Start—and we don’t know if it will keep the name—will apparently not be focused on much of anything local, and the odds of them serving DOMA coffee are slim. DOMA is now confirmed! Woo! Not that we’re ready to judge the place yet (it might end up being a good spot for all we know), but when it is set to be redone as a “cool college hangout spot…” Well, let’s just say we’ll wait and see. The original’s awesome empanadas and creamcheese muffins will be missed at any rate. As for co-owner Marc Gauthier, you might (note the emphasis there) see him working to some degree with another coffee spot in town, Coffee Social. 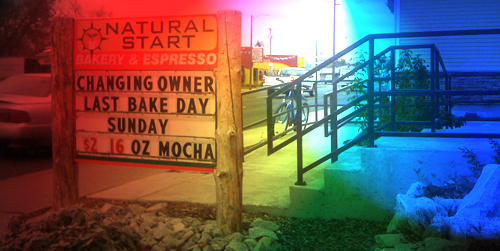 We highly recommend checking out Natural Start’s awesome baked goods while you still have the chance. And when they’re gone, go to Coffee Social—they deserve your support.